PATHS. They begin at our door and run through our lives. They rise and buckle and lead us to unknown places. They appear in all guises: woodland paths; coastal paths; moorland paths; paths of righteousness; paths of destiny. Sometimes they are little more than faint runnels crossing wasteland along which bent men plod and dogs follow. Sometimes they are enchanted ribbons where poets linger. Most were made with purpose though some without consciousness. They link places and experiences. And they all lead somewhere . 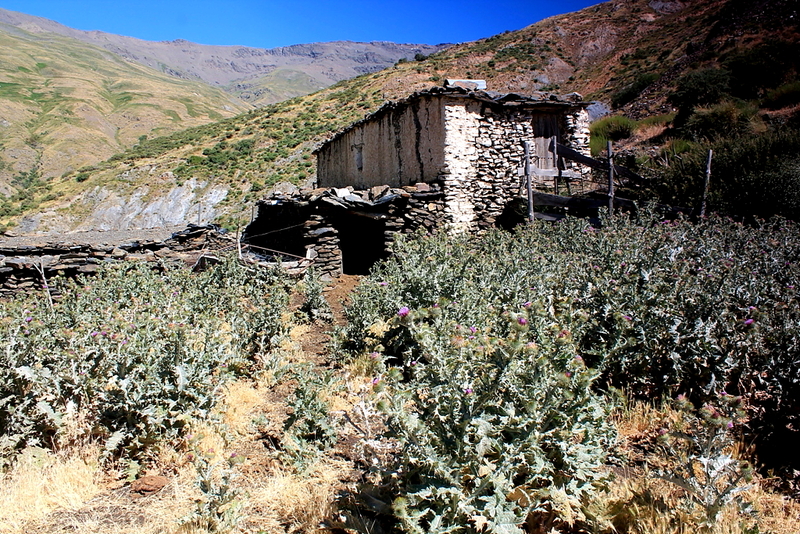 . .
Several weeks ago, while visiting the village of Capileira, I spied a path of the enchanting variety sweeping across the steep slopes of the Poqueira gorge towards Mulhacen, Spain’s highest mountain. 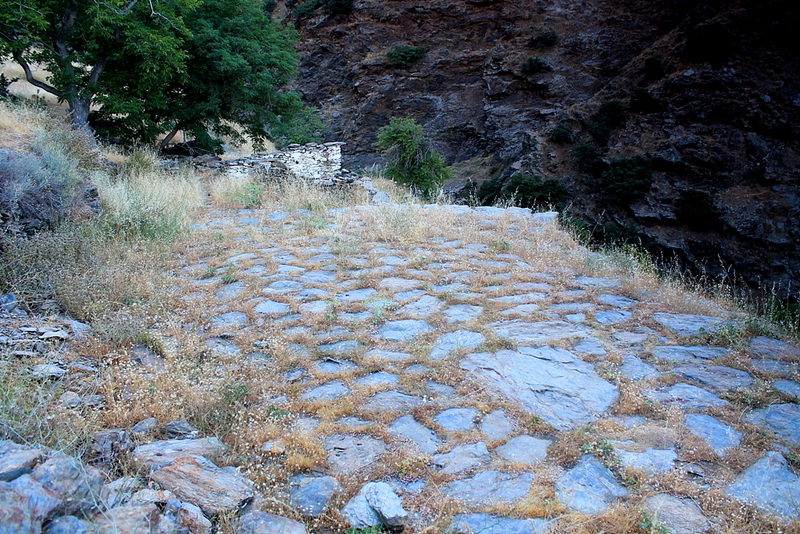 It was a cobbled path, elevated on terraces and fashioned by men who knew what they were doing. I sat on a wall and traced its course into the shady gorge, not knowing where it led but overcome with a desire to find out. This path was more than a runnel between places; it was a thing of beauty enticing me towards unseen waterfalls, high pastures, and mountain glades where sunlight drips through green canopies. 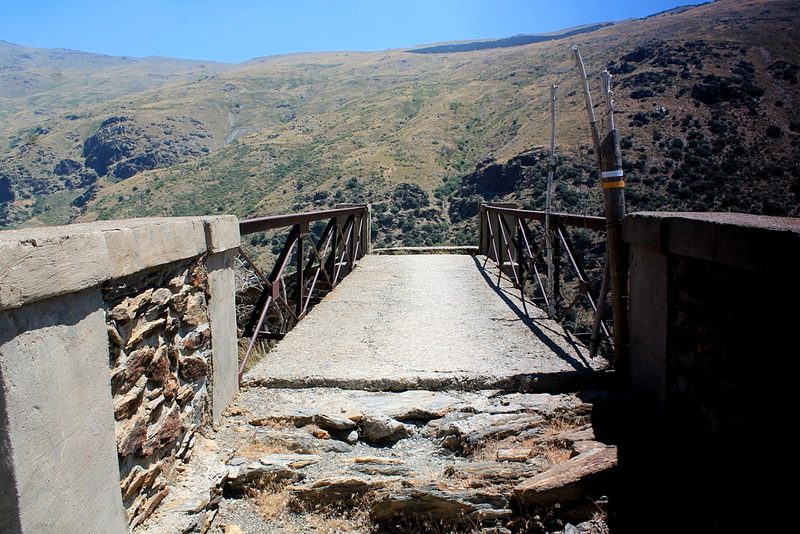 Today I’ve returned to Capileira (altitude 1,444 metres). 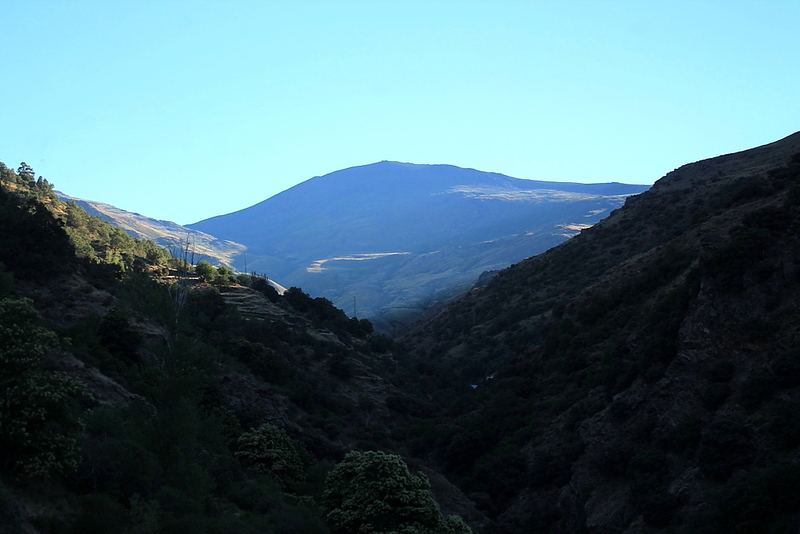 The sun rises behind dark rocky mountains as my path delivers me into the inky shadows of the Rio Poqueira. Cowbells chime beneath folds of chestnut and oak. Streams chatter. A wholesome feeling warms my breast and my pace quickens. A corner of a foreign field that might well be forever England – only it’s Spain. Good to see old baths used as animal troughs. Not so sure about the pink colour scheme, though . . .
Let me tell you about my plan. Basically, it doesn’t exist. It’s more of an idea than a plan. Sometimes this type of arbitrary approach to hill-walking works well and results in a memorable excursion; though, admittedly, there exists the potential for disaster. But what the hell. I possess a map of the area – Sierra Nevada Parque Nacional, scale 1:40,000 – and although it’s not a particularly good map, and I have allowed it to lead me astray on previous occasions, I have located my path amid its tattered folds and determined it meanders through peaceful mountain pastures to a settlement called La Cebadilla. 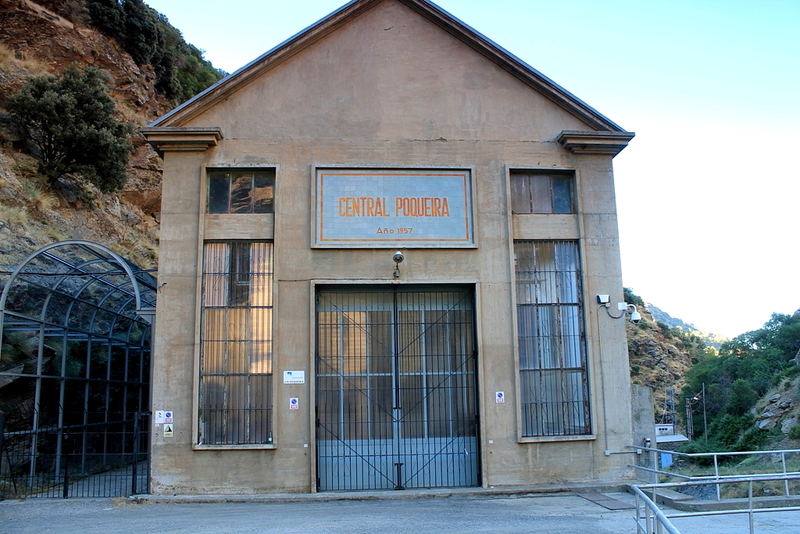 La Cebadilla, which is little more than a remote hydroelectric plant in a shady ravine, is not unknown to me. 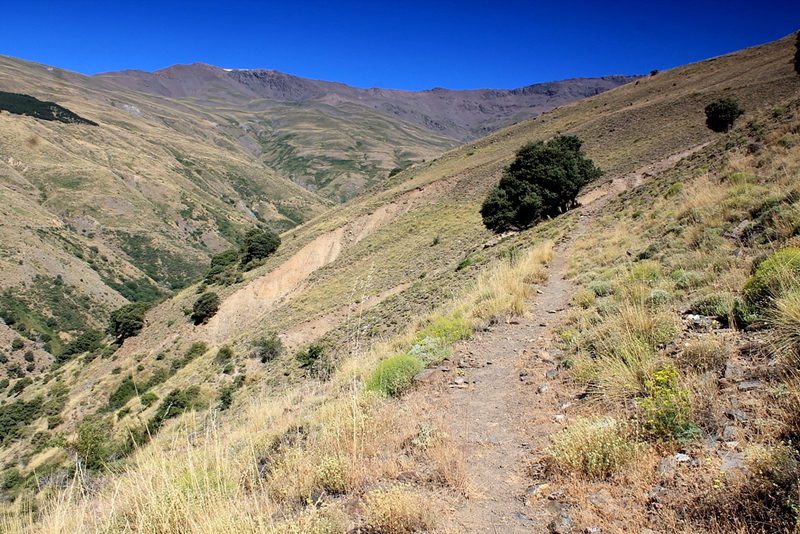 It can be reached by car along an interesting dirt track and was the starting point for my ascent of Veleta – Spain’s third-highest mountain – back in 2009. The ascent, although successful, was nothing short of torture. I will not be embarking on such an undertaking today. 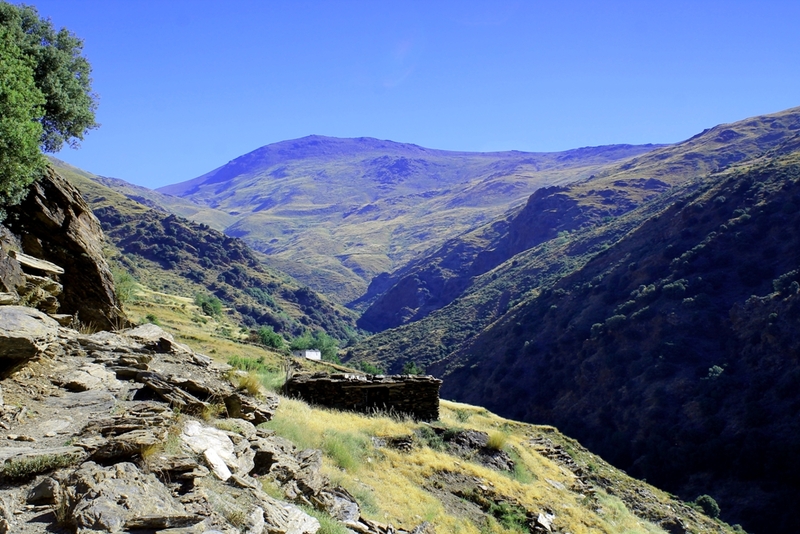 But from La Cebadilla I can head for new places, such as the valley of the Rio Toril, tucked high in the crumbly folds of the Sierra Nevada. I’ve read that up there in that seldom-frequented place are three abandoned farmsteads. Sounds like it’s worth a walk. 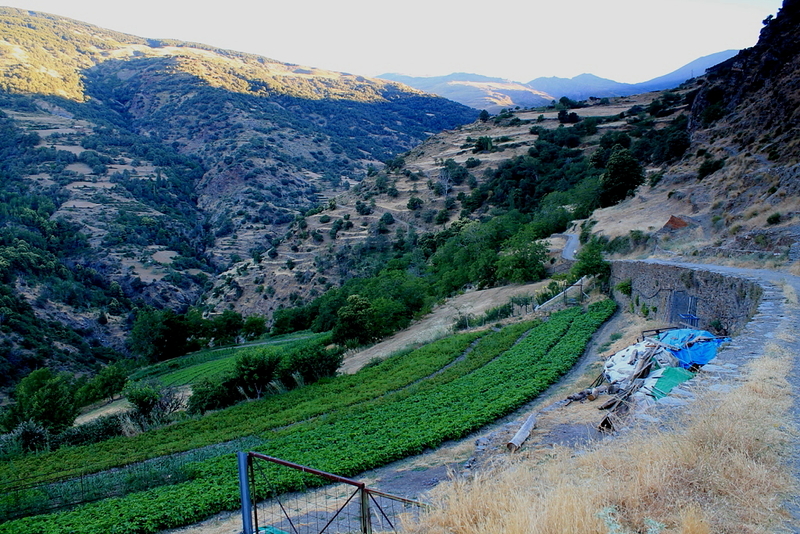 From the white walls and red-tiled roofs of Capileira, my path takes me in steep zigzags down into the gorge of the Poqueira and the deep shades of early morning. 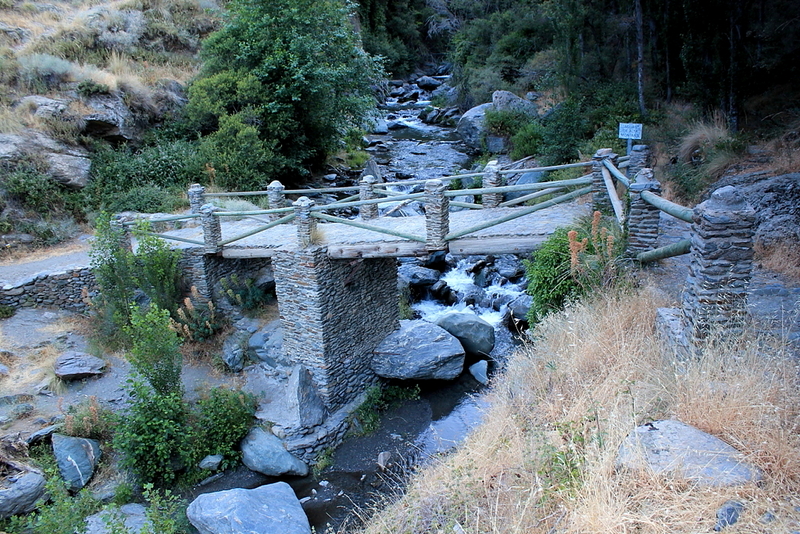 I cross the river on a stone bridge – el Puente Abuchite – and begin my climb to La Cebadilla, traversing meadows and woodlands, and passing ruined cortijos and stone-flagged threshing floors where men who long-since breathed their last scraped a living from crops of oats and barley. As I anticipated, this path is a joy to tread. In contrast to my recent walk up Sierra de Lújar – which I can see in the distance – there is no shortage of water. 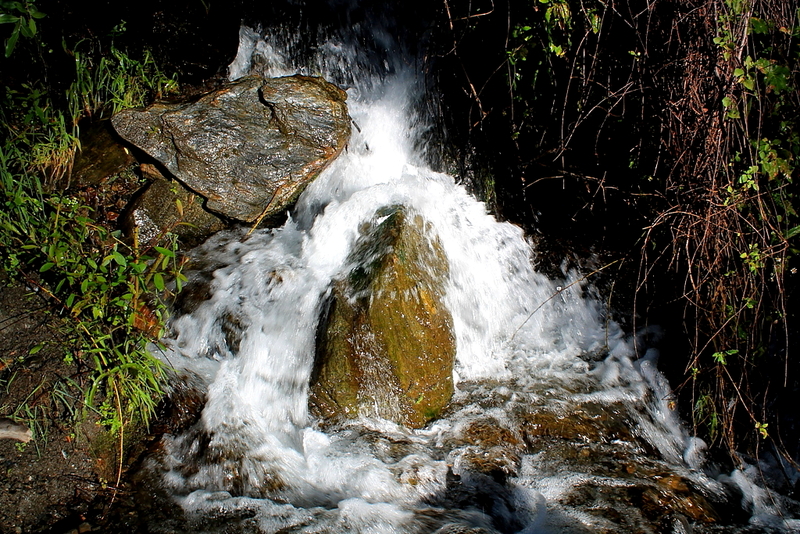 Fresh streams tumble across the route at almost every turn. Green is the dominant colour; the subdued roar of the Poqueira the dominant sound. 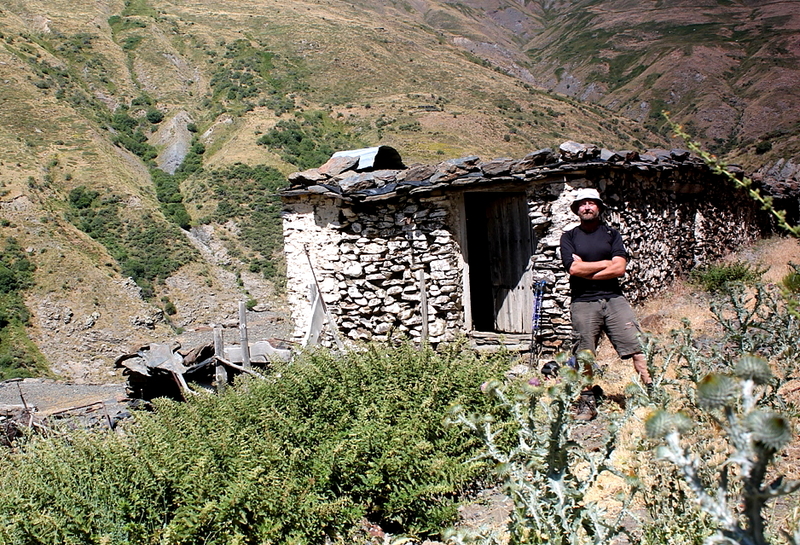 A little over an hour after setting out I saunter into La Cebadilla. This is an odd place. Built to house construction workers during the 1950s, nothing remains except the hydroelectric plant and a scattering of shabby buildings (houses, chapel, pigsties, hen-runs), most of which appear to have been abandoned many years ago. 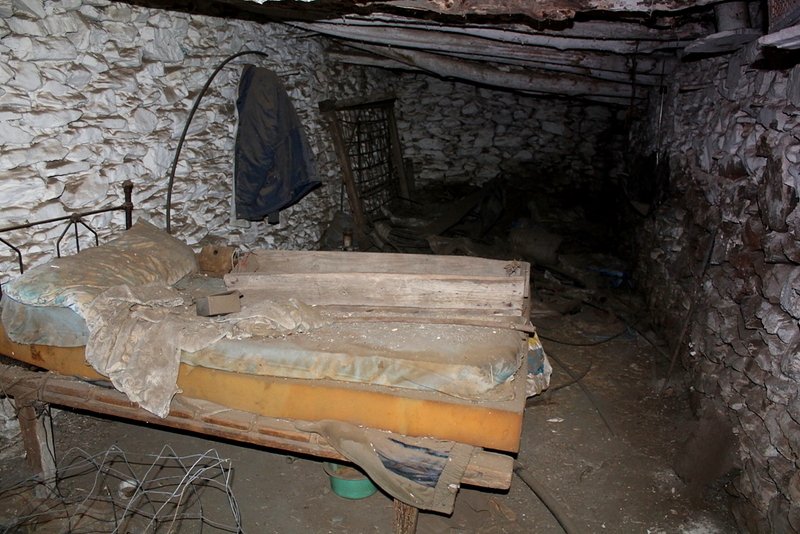 It is, by all appearances, a ghost settlement along the lines of those mining towns of the Old West. No old-timers here, though. Perhaps the occasional appearance of a couple of workmen maintaining the generating plant, and the infrequent part-time farmer visiting his scattered herd, but like the gold rush of the 1840s, the construction rush of the 1950s has come and gone. Here’s something to ponder. Southern Spain, with its Mediterranean climate, spends a large portion of the year in what can reasonably be described as a state of semi-drought. 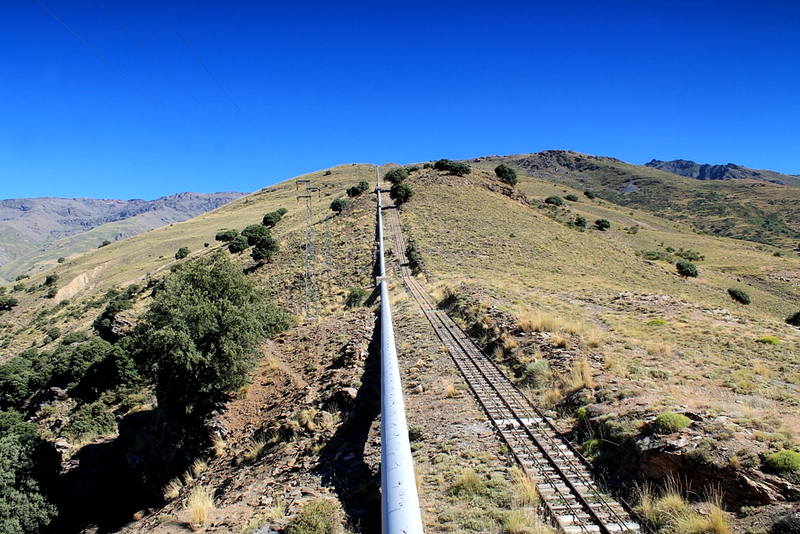 But before this small though energetic river reaches the coast, it encounters at least four substantial hydroelectric plants generating renewable energy cleanly and efficiently. Yet in some parts of Europe there are very rainy countries where water is allowed to drain into the sea unused and hosepipe bans are imposed at the drop of a chief executive officer’s hat. Do you know one? 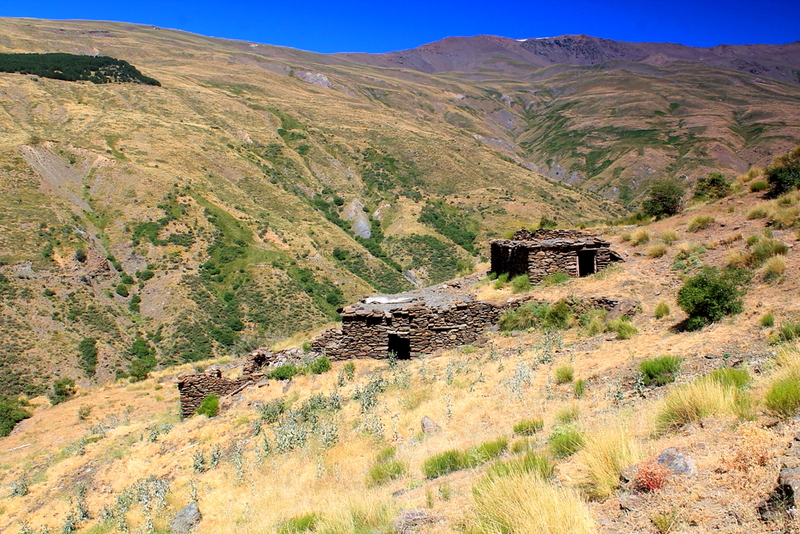 La Cebadilla also signals the end of the pleasant climb from Capileira and ushers in the steep and gruelling slog up the Loma Púa ridge towards the summit of Veleta and the crumbling spine of the high Sierra Nevada. I’ve climbed this route before, though today I’m jumping off at the first opportunity and heading into the Toril valley. But not before trundling wearily around the twenty-two hairpin bends of the initial section while ascending into burning sunshine. Rewards are showered on the struggling in the form of fragrant, semi-Alpine meadows through which the path meanders, and views of the imposing southern slopes of Mulhacen. Up here, I am alone in the majesty of the mountains. The sweaty slog – as with most sweaty slogs, I’m sure you’ll agree – is worth the effort. Puente Toril is an iron bridge bounding over pipes that deliver water under pressure to the hydroelectric plant hundreds of metres below. 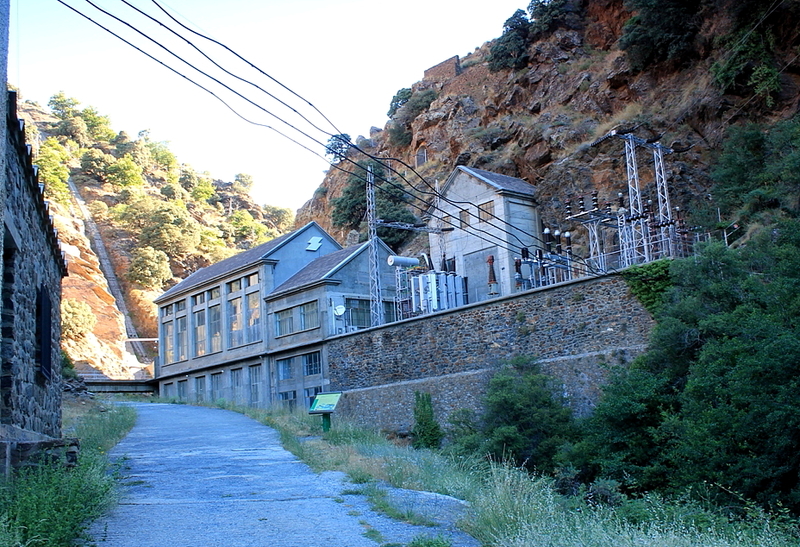 These hydro schemes were built during the Franco era. It would be interesting to know if forced labour was used, as it was in other sectors during the post-civil war period. I should look into it. But not today. 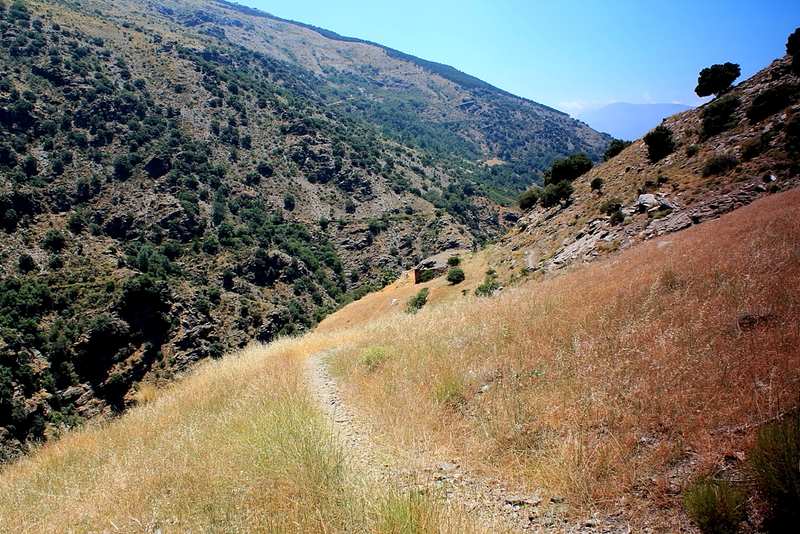 Another pleasant path takes me through scrubland into the valley of the Rio Toril. 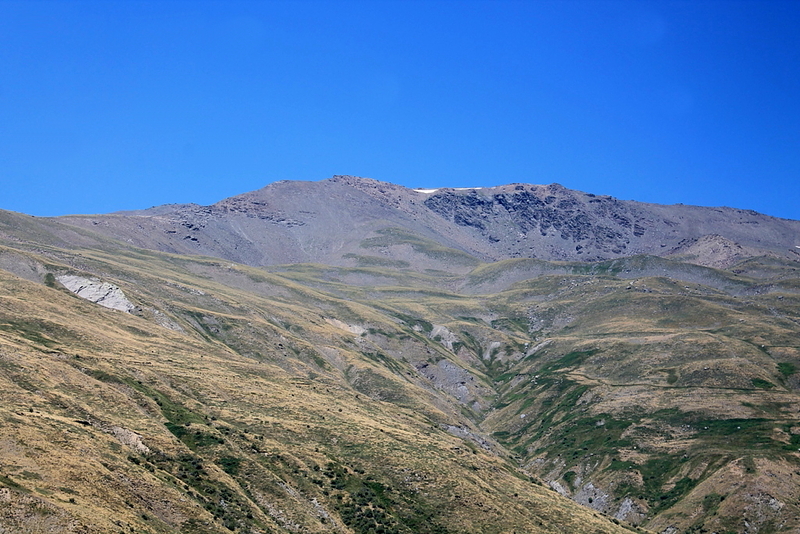 The great whaleback of Pico del Tajo de los Machos dominates the valley head, shepherding back uncomfortable memories of an ascent in October 2010. That was an unforgiving and thoroughly disheartening slog as well. Come to think of it, all the mountains are like that round here. The Munros of the Scottish Highlands are picnics by comparison – even that demoralising and seemingly endless slow-motion trudge up Ben More from the A85. But at least you get sunshine and a guaranteed view on Pico del Tajo de los Machos – two things I certainly didn’t get on Ben More . . . and many of its neighbours, now I think about it. 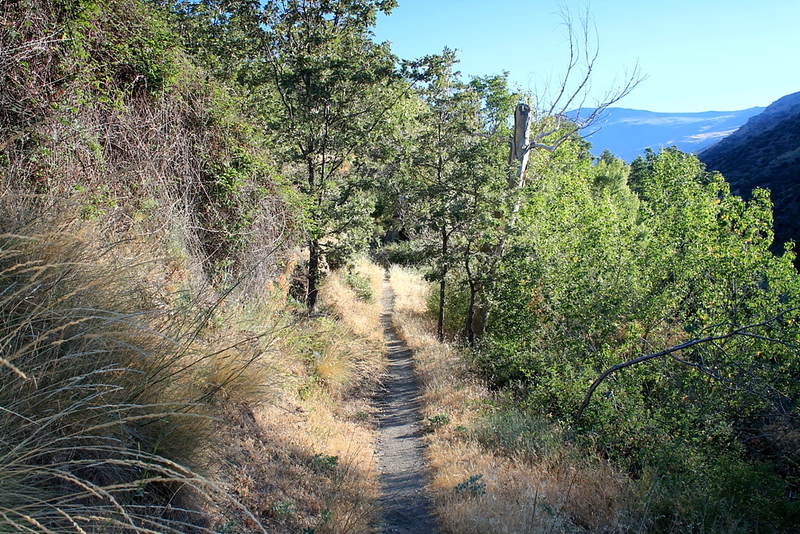 My path conveys me to the ruins of the three cortijos – or country houses, if I may employ a common and generous euphemism. 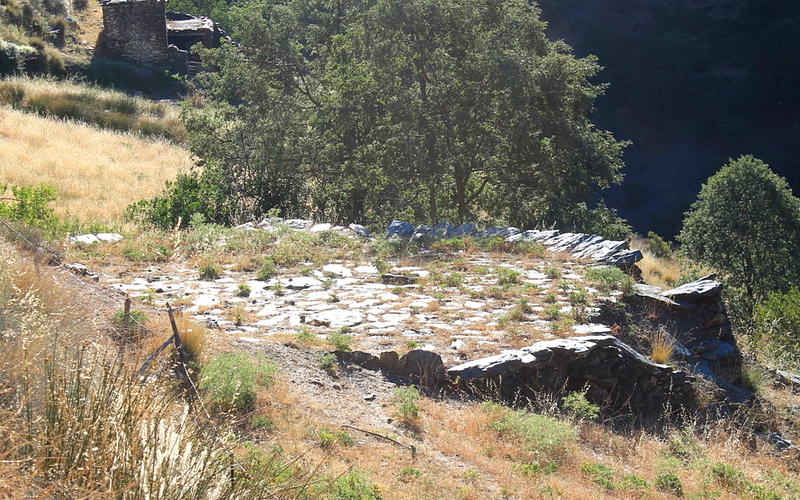 It becomes evident that these structures – Cortijo Toril, Cortijo Antonio Domingo and Cortijo Combate – have not been abandoned in the strictest sense. 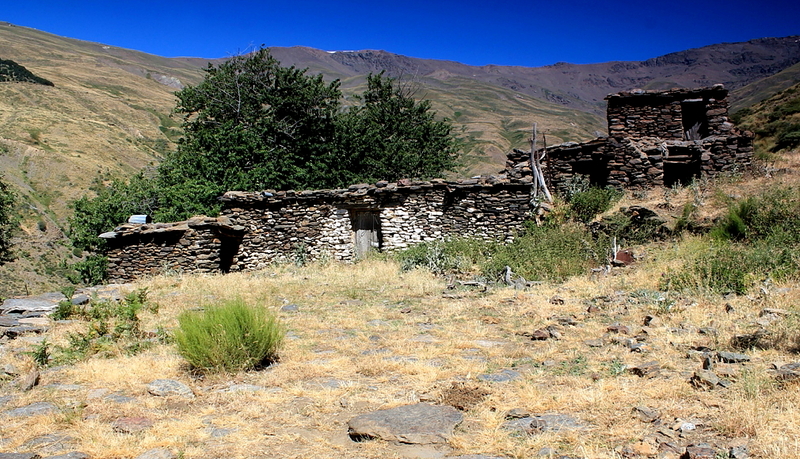 Basic shepherding tackle is stored in several of the buildings; the roofs are maintained; and they are still used as rudimentary shelters by, presumably, the people who own them. 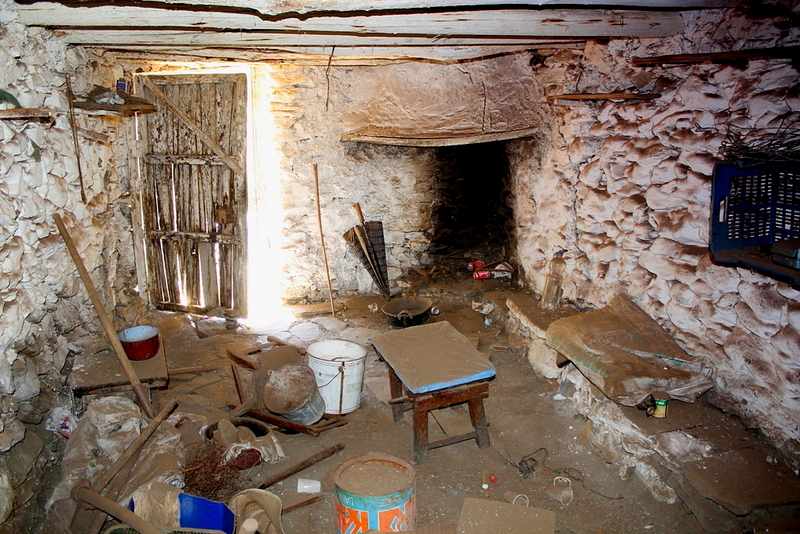 Beneath the floor of Cortijo Combate, cattle stir contentedly in a shady byre. Their body heat would probably render the place quite cosy during a winter’s night when wind howls through the mountains, though it’s not the sort of place I would bed down voluntarily if there was an alternative on offer. And another thing: it’s a long walk from La Cebadilla to milk a cow. 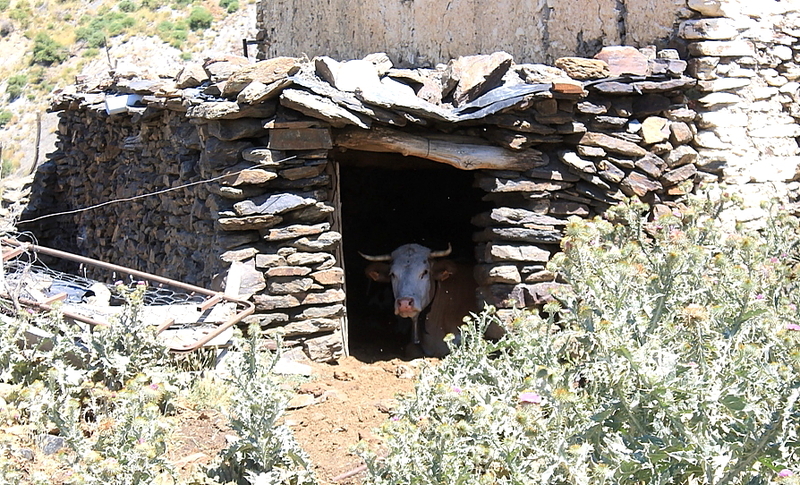 What on earth are these beasts doing up here (altitude 1,890 metres)? No. I wouldn’t sleep in it either . 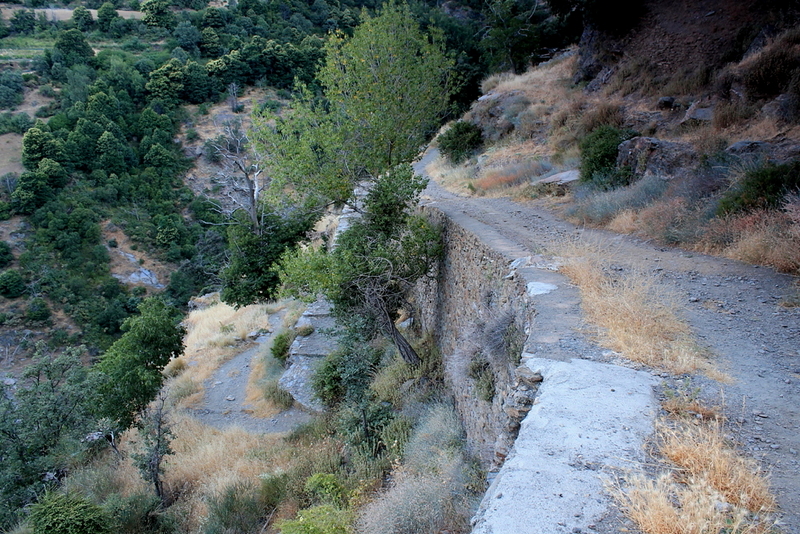 . .
A few metres beyond Cortijo Combate my diminishing path is swallowed by a series of deep and ugly landslips. I have no desire to cross them, or bypass them above or below – either of which would require a great deal of effort – so I sit in the shade of a piny tree and make a meal of bread, cheese, tomatoes and fruit. A crisp white wine would go down nicely, thank you, but you can’t have everything. Then I retrace my steps beneath an afternoon sun, through the Alpine meadows and shady woods where streams bubble between rocks. 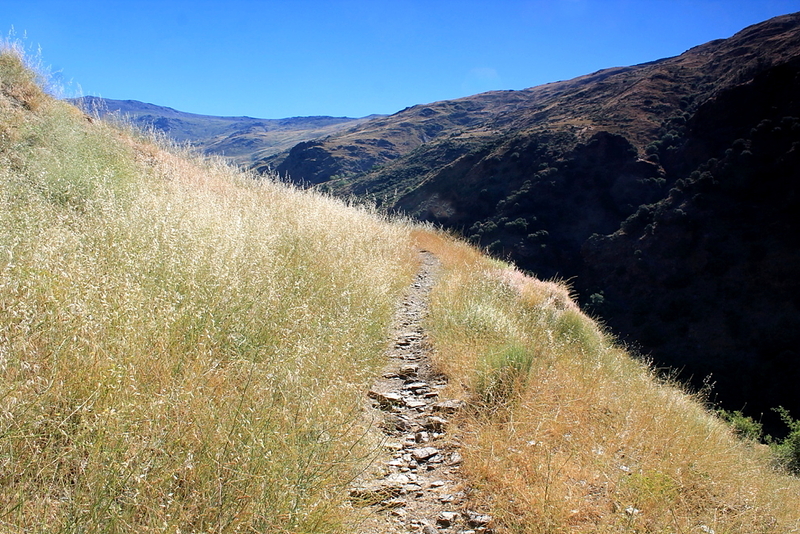 And as the sound of church bells drifts from Capileira many hundreds of metres below, I revisit a notion which surfaces occasionally on my mountain walks: that good paths, alluring paths, enchanting paths, invariably lead to wonderful places. It is certainly true on this occasion. This entry was posted in Climbing, Environment, Footpaths, Gerald Brenan, Hiking, History, Industrial archaeology, Mountains, Rivers, Ruins, Spanish Civil War, Threshing floors, Walking, Weather and tagged Alpujarra, Alpujarras, general francisco franco, Munros, outdoors, Scotland, Sierra Nevada, Spain, The Munros, WPLongform. Bookmark the permalink. Ehat a great way(!) to start a text in hiking with a philosophical pondering on paths!!! Hi Bernd. Thanks for that. Greatly appreciated. Thanks for broadening my Monday horizon. Excellent post, as ever. Hiya Ronnie. Mondays can be a drag. Thanks for your comment. Warm sun and cool wine, what more could you need, James? Mind you, the cow got a bit agitated when I moved closer to get a picture, so you might have to find an alternative cool spot! Well worth reading, as always, and stunning photos. Makes me wish to see it for myself. 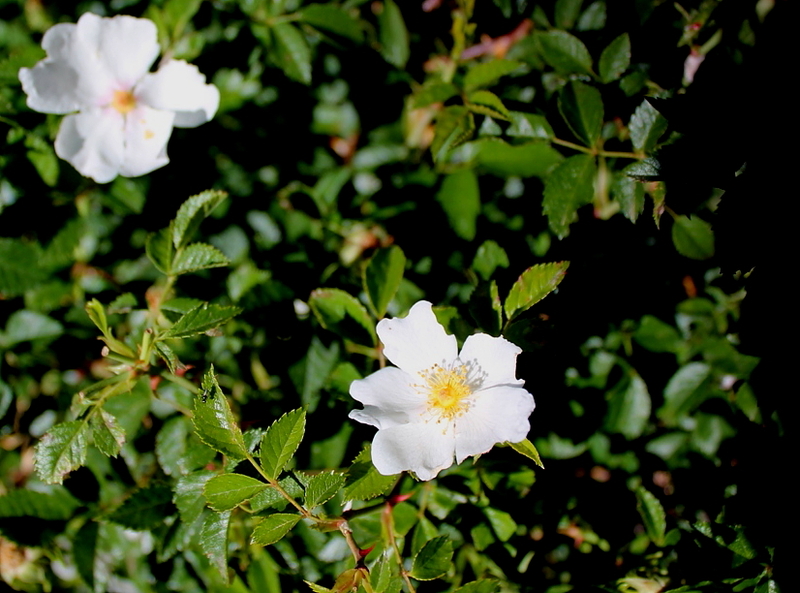 It’s almost possible to feel the heat, and experience the scents of the wild plants and herbs. I find ancient paths and tracks fascinating, and like the history behind them. There’s a forlorn feel to abandoned dwellings, when one comes across them, and I always wonder about the people who once lived there. Hi Alison. I’m glad you liked the article. I feel exactly the same about abandoned dwellings and ruins. To think that people once lived in these structures, and the hardship they endured, puts modern living into perspective. All sorts of human drama and tragedy was enacted in these places. Hi Iain. Could do with some of that rain here. I think it’s pretty certain you’ll have dry weather when you land. Don’t forget to drop me a line. And I want to know about Valencia because other than this small corner of Spain where we happen to be living, I haven’t much of a clue about the rest of the country. It’s enlivening to find the lush hiking. Is it okay to drink the water from the river? Agitated cow? Normally they are very social. But I’m not familiar with those in the mountains. Well, I didn’t get into any fights on this trip, Hanna, but that doesn’t mean to say I won’t on the next one. The water is fine to drink but I have got into the habit of adding a purifying tablet to every bottle I scoop up, just to be on the safe side. I have a guidebook that recommends adding a drop of bleach to every bottle, though it doesn’t say how big a drop. I’ll stick to the tablets. The cow got a bit too lively when I approached it, and I think there were others in there as well. So it had back-up. I was outnumbered. It’s a great idea with purifying tablets. You don’t have to struggle with anyone if you drink contaminated water. In Norway it is okay to drink water from streams, but sometimes there are exceptions. For example in a lemming year. Denmark has developed a product called: Life Straw, a portable water filter. I haven’t tried it and I don’t get kickback! Streams in the English, Welsh and Scottish mountains are generally fine. Some people won’t drink from them but I have had no problems. I once had a nasty episode on the Isle of Skye, but I think that was a dodgy bag of fish and chips rather than drinking from a stream. I don’t think I’d risk it in Egypt. The crocodiles would put me off. It’s as easy as that! My wife, Anne, did something similar in Morocco. That was the end of that holiday. I’ve started to read these posts with the twangy guitar music of spaghetti westerns in my head. You need a mule. The highest mountain in Spain doesn’t look very high in the photos, but I reckon I’d change my mind once I was stood at the bottom of it. 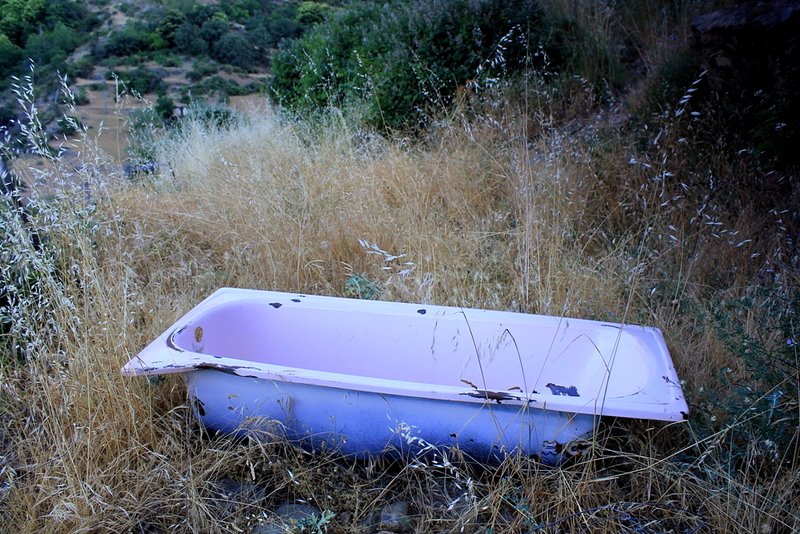 And the pink bath looks almost as good as the aubergine one in my bathroom. Ha ha. I’m laughing because when we moved into a house in Marton, Cumbria, in 1982, there was a bathroom suite that was aubergine, and it included a bidet but it was cracked. I had to throw it out because I couldn’t get a replacement to match. Nevertheless, it felt like a case of “we’re ‘avin none o’ that fancy foreign French stuff in ‘ere, I tell thee.” Also, it made a bit more room when it was removed. 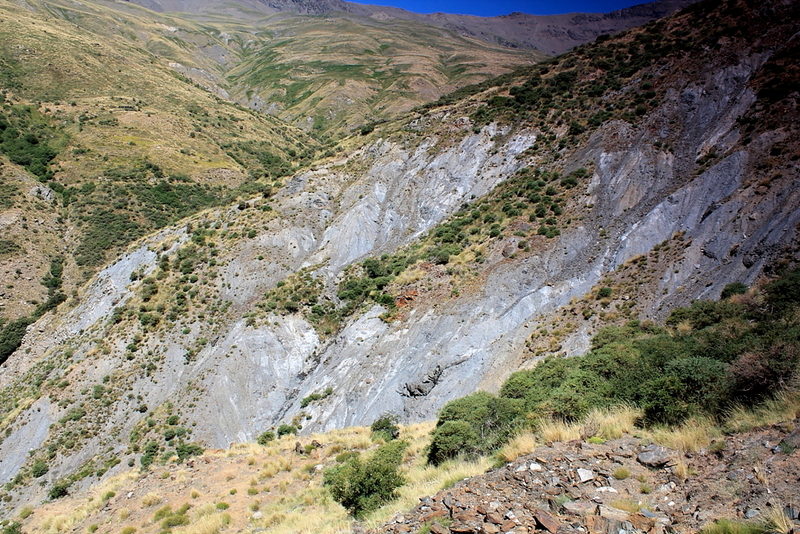 Mulhacen is just short of 11,500ft high. From where I took the picture, there is about the equivalent height of Ben Nevis left. And my neighbour, Augustine, has a mule. I’d love to borrow it for a day. Giddy-hup. I’ve just been corrected by the resident expert and apparently the bidet was wild violet, not aubergine. An easy mistake to make. That’s made me think the bath might be avocado. They’re green aren’t they? I thought you were a landscape gardener. Avacados are dark green on the outside and a sort of mucky yellow on the inside, but if they’re not quite ripe then they are a sort of lime green on the inside. Anyway, at least it’s not pink like the one in the picture. After a day in the sun you wouldn’t be able to see your legs in that bath! Plants were never my strong point. What a fantastically atmospheric place! And as for cowbells, I just love falling asleep listening to them…. They have such a romantic sound. I expect to see Heidi at every turn. Fascinating walk that. The cows would be beef cattle I think – like you said, no-one would want to trudge up there twice a day to milk them. You have my sympathy, Carol. We had exactly the same problem selling our house last year – the estate agent advised us to change some carpets and decorate a couple of rooms in different colours. What aggravated me more than anything was that he turned out to be right. We were lucky in that our bathroom suite was very old and so it had reached the antique stage and had sort of become fashionable again (not the wild violet one, this is the house after that one). When I look at a house I see its potential, not what sort of bloody paper is on the walls. Anyway, thanks for the rant. You’ve got me going as well now. me too – it’s pointless having to redecorate rooms or change carpets as it’s likely those are the very first things people will do (or re-do) when they move in anyway! Great post Alen, I wish I could write like that. Thanks for that lovely comment, John. I think you’re a good writer because your posts are always full of interesting things that other people don’t know. And if you can hold a reader’s interest, that is what counts.